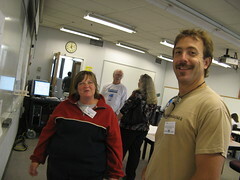 In the morning Beth presented information about the Mechanical Dissection/Reverse Engineering approach presented at the Redwood Science Project 2003 How It Works Institute. Sheryl shared how she uses the approach in her class. Ken reminded us we should take care to avoid dissecting devices that have hazardous materials. 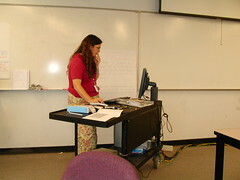 Beth showed a few sites, including the Product Dissection Course Materials for the Mechancial Engineering Education Partnership and Standford’s Bicycle Lab. We also discussed an interesting way to fill a tire. Jim presents on Gibbs Free Energy. Jim answered questions from the Minute Papers. We visited Skype. Jim talked to us about how a fuel cell car would work and about the importance of avoiding CO in hydrogen, as CO fouls the platinum catalyst of the PEM fuel cell. 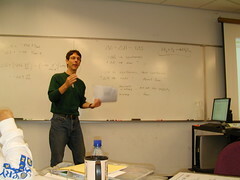 Jim did talk to us about Gibbs Free Energy. He dropped a factor of 1000. Errin helped him find his zeros on the floor! 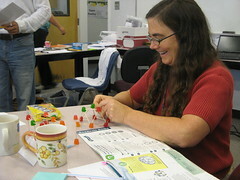 Beth builds a dome from the Building Big curriculum. Participants were encouraged to review the relevant bridge curriculum material available on the Building Big site where there are lots of quick inexpensive demonstrations. Lonny presented an overview of statics and bridges (see presentation below). The group used simple exercises to build their understanding of statics, triangles and trusses, such as a straw rectangle vs triangle, pushing hands and pulling hands. Discussed using Embedded Energy (aka embodied energy, aka emergy) as a criterion for bridge design. Discussed Life Cycle Analysis, and looked for the excellent EIOLCA tool. Byron worked with Brooks to develop this pasta bridge. 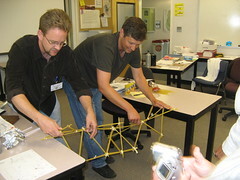 Byron and Brooks prepare their bridge for testing. 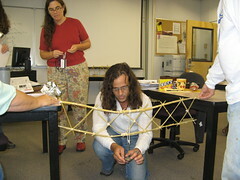 Participants had an hour to design their bridges in groups of 3. Teachers were given 1 meter of tape and a package of pasta. Folks ended up needed more tape and time. After lunch, the bridges were judged by Lonny, Julie and Beth on the criteria listed above. The bridges were judged using this Delphi Matrix based upon the stated criteria. The bridges failed at 249g, 70g, 90g, and 180g. Lonny puts weights on the bridge to test it. Consider not using masking tape. Possible substitutions are white glue, hot glue. Consider using different materials for Compression (straw) and Tension (string). Consider asking students to keep journals. Change the assignment so it is shorter, uses less materials, or provide more time. Errin shows a bridge his students created last year with manila folders. 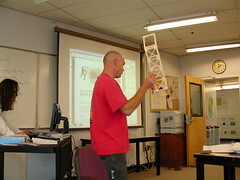 Errin presented the curriculum he used last year to teach about bridges. He described the difficulties the students had (procrastinating and patience) and the lessons they learned. 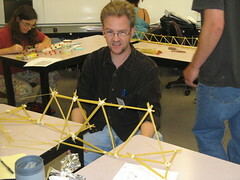 Although most students waited until the last minute, most of them did finish their bridge projects and felt successful. He plans to implement the curriculum again this fall, with some changes. He plans to set more due dates for the students and require that they only build half a bridge. Errin also uses Mousetrap race cars. Although one can buy kits online, Errin prefers to use most of his own materials. He tells the students they need to give him $5 if they want to keep their cars. Maureen of Citrine catering presents our dinner of tamales, beans, salad and cobbler. Participants then began preparing materials to present to the engineers, who would arrive at 4pm. 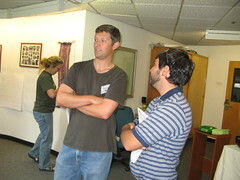 At 4pm, folks began to share their ideas with the engineers after a short introduction. 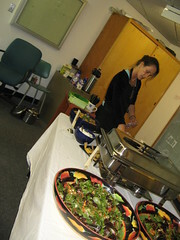 At 5pm, Maureen of Citrine Catering served a dinner of tamales, salad, black beans and berry tartlettes. Mike Foget asked what were the next steps. Beth said there would be a meeting in September with folks from Project Lead the Way, professionals, and educators. James Van Bonn let Beth and Lonny know he is interested in helping with any type of problem solving. Carlos Diaz shared information about Sewer Science curriculum and equipment. He says to contact him if you have questions. Carlos and Brooks discuss the possibility of an engineering club at EHS. 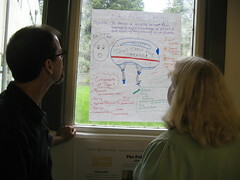 James and Sheryl think about the bike helmet project. Michael and Becca discuss the plankton buoyancy project. Folks continued to talk and most left by 6:30pm.